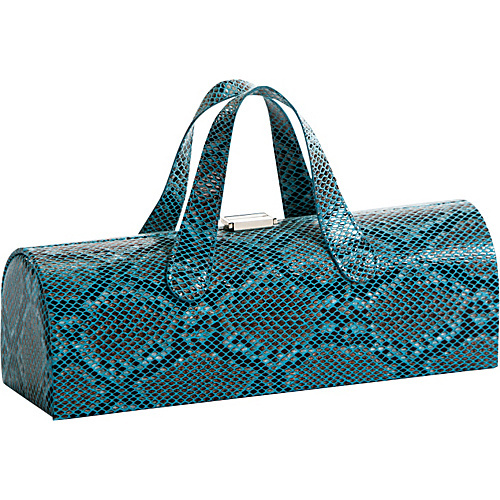 Carry a bottle of wine to a dinner party or BYOB restaurant in this stylish Snake print bottle tote from Picnic Plus. The Picnic Plus Carlotta Clutch Wine Bottle Tote is available in a variety of textured solid colors and bold animal prints and offers a unique look that you can carry as a cool little clutch that no one will suspect is carrying a bottle of wine. This bottle tote features a soft suede lining with an elastic strap that hold your bottle in place, a small inside pocket to hold your keys, ID, or other small accessories, and double top handles that make it comfortable to carry. Go out and hit the town with the very fashionable carlotta clutch from picnic plus. You will be the envy of all your friends during girl’s night out, date night, or just traveling to your favorite restaurant with this stylish wine bottle clutch. Soft sueded lined with an elastic inside pocket to hold keys, id and more. the carlotta clutch securely holds 1 bottle with the elastic inside strap. Carry it as a purse….only you will know what’s really inside!